 We are so pleased you are considering Ray’s in the City for your special event! 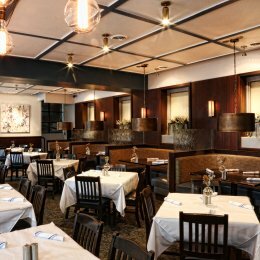 Whether it’s putting together fantastic corporate dinners and receptions, rehearsal dinners, birthdays, anniversary celebrations, holiday parties or Bar/Bat Mitzvah celebrations, we can accommodate any where from 10 guests to full restaurant buyouts and are here to handle all of the details! Our team includes award-winning chefs, a highly-trained service staff and a dedicated Events Manager who will work with you every step of the way as you plan your event. 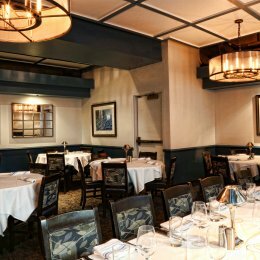 Perfect for a party or meeting, the Atlantic Room is a private dining space located off of the main dining room. 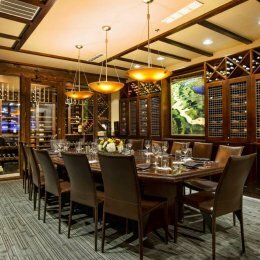 You and your guests will be surrounded by sculptural wine cases and the warm glow of warm pendant lighting. The Atlantic Room is adjacent to the Chef’s Area, which can either be set with additional tables or for a cocktail reception. The Wine Cellar Room is a unique space adorned with an impressive wine cellar along the back wall and a view to the main dining room. Rich wood tones, ambient lighting and flexible table arrangements make this perfect for a special gathering, meeting or party. The Chef’s Area is an excellent option for a smaller dinner gathering or cocktail reception. Enjoy a very special setting filled with beautiful sculpture, artwork and dramatic lighting. 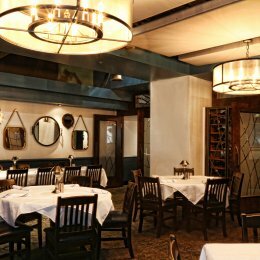 The Peachtree Room is a warm and inviting private dining space located at the front of the restaurant. Take in panoramic city views of Peachtree Street from the windows that run the length of the room. This space is ideal for groups with up to 75 guests.